In this Dutch name, the family name is van der Weijden, not Weijden. 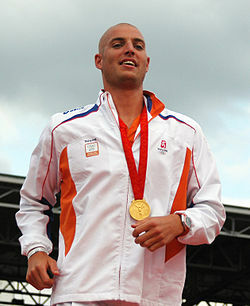 Maarten van der Weijden (born 31 March 1981) is a Dutch long distance and marathon swimmer born in Alkmaar. Van der Weijden was known as a promising swimming talent in his youth, becoming Dutch national champion at the 1500 m freestyle (1998 (short course and long course), 1999 (lc) and 2000 (lc)), 400 m freestyle (1999 (sc+lc) and 2000 (lc)) and 5 km open water (2000). He also participated at the 1999 European Junior Championships and the 2000 Open Water World Championships. In 2001 he was confronted with leukemia and his career was likely to be over. After surviving cancer he made his comeback in 2003. He qualified for the Open Water World Championships in Barcelona and won another three Dutch titles; 800 m freestyle (sc+lc) and 1500 m freestyle (lc). He became seventh over 10 and 25 kilometres at the 2004 World Open Water Championships and added a Dutch title at the 800 m freestyle (lc) and 25 km open water. Later in 2004 he swam across the IJsselmeer in 4:20.58 hours, breaking the former record by almost 15 minutes to collect €50,000 which he donated to cancer research. In 2005 he won the Dutch title over 400 m freestyle (sc) for the second time in his career. He finished in fifth position at the World Open Water Championships over 10 km and sixth over 25 km. He also won three World Cup meetings in Ismaila, Al Fujeirah and Dubai. In 2006 he won a silver medal at the 2006 European Aquatics Championships over 10 km. Van der Weijden had his own website named "Maarten van der Weijden zwemt tegen kanker" (Maarten van der Weijden swims against cancer) where he informed his fans about his life and his career. He also collected more money for cancer research. He won another World Cup race in Rosario, Argentina in January 2007. At the end of the World Cup calendar he finished in second position overall and during the 2007 World Championships over 10 km he finished seventh. His aim was to become World Champion and he fulfilled this aim when he won the 25 km at the 2008 World Championships in Seville. He also won a bronze medal at the 5 km there and became fourth at the 10 km. This result qualified him for the 10 km open water marathon race at the 2008 Summer Olympics in Beijing. There he won the gold medal on August 21, narrowly edging out David Davies of Great Britain. He announced the end of his professional swimming career during his acceptance speech as Dutch Sportsman of the year in 2008. On May 22–23, 2017 Van der Weijden in Amsterdam attempted to break the world record 24 hours swimming. He finished the non stop swimming marathon, but he did not succeed in breaking the world record of 102 kilometers. He completed 99,5 kilometers in 24 hours. With his sportive achievement he collected €8500 for the benefit of cancer research. In march 2018 he tried to break the world record again, in which he succeeded by swimming 102,8 kilometers in 24 hours. In August 2018, Van der Weijden started an attempt to swim the entire track of the Elfstedentocht, a famous 200 km outdoor ice skating race in the north of the Netherlands. The purpose of this event was to raise funds for cancer research. Sponsors were invited to swim along with him for portions of the distance. The day before the race, the organizers and health experts had to conclude that due to E. coli the water quality was too poor to swim for the sponsors, but Van der Weijden decided to push through, without the sponsors swimming along. He scheduled this attempt to take 3 days, while only taking short naps - but taking slightly longer (3 hour) breaks was necessary to continue. The attempt was live streamed by the national broadcaster NOS on their website and closely followed in national news. Eventually, with less than 10 km left to Dokkum, he had to cut his attempt short due to illness sustained in the water. At that moment, he already had swum a distance of 163 km in 55 hours time raising over €4,3 million for cancer charities. By October the total had reached €5 million. On March 27 2019 Van der Weijden announced that on June 21 2019 he will start a second attempt to swim the whole eleven-city tour. In the 2017 Dutch general election, Van der Weijden was a Lijstduwer for the People's Party for Freedom and Democracy. ^ Lamme, Zander (2018-08-18). "Van der Weijden begint aan zwemtocht van 63 uur". www.telegraaf.nl (in Dutch). Retrieved 2018-08-19. ^ "Al 731.000 euro opgehaald voor kankeronderzoek Maarten van der Weijden". Omrop Fryslân (in Dutch). 2018-08-13. Retrieved 2018-08-19. ^ "Organisatie Elfstedentocht Van der Weijden raadt sponsorzwemmers af mee te doen" (in Dutch). Retrieved 2018-08-19. ^ "Van der Weijden komt onder enorme belangstelling door in Harlingen" (in Dutch). Retrieved 2018-08-19. ^ "VVD-lijstduwer Van der Weijden gelooft in stimuleren en zelf doen". NOS (in Dutch). Nederlandse Omroep Stichting. 25 February 2017. Retrieved 28 April 2017. This page was last edited on 28 March 2019, at 00:18 (UTC).